Tea time turns authentic adventure when traversing through the endless and all-encompassing tea plantations of Wazuka, Japan. 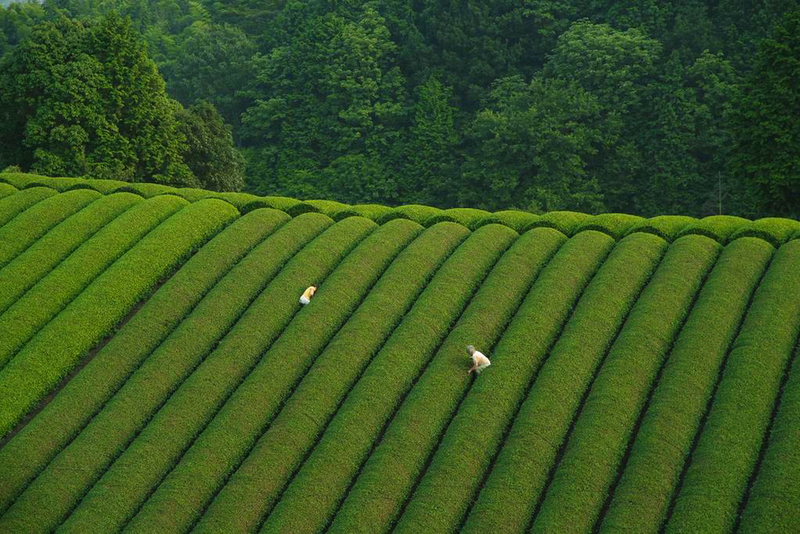 Get off the grid and get on the green at Obubu Tea Farms. Located in the rural town of Wazuka, Obubu offers guided tours of their lush farmlands. Their tours also include a sampling of half a dozen different kinds of tea, presented by a certified tea instructor. The tour is priced at 12,000 yen per person, which in today’s market translates to about $115, a price that is worth it just to see the sprawling, surreal countryside alone, not to mention an included lunch and tea samples to take home with you. Wazuka is a fair distance away from the nearest metropolis, but it is incredibly easy to get to. We recommend catching a direct flight from any major US city to either Kyoto or Osaka, and then take either train or bus to get to Wazuka. The bus stop in the town is a short 20 minute walk from the headquarters of the Obubu tea company, making it a journey that can be accomplished without any stress. There are few major accommodations to be had directly within Wazuka, but there are numerous hotels just a few miles outside the town. The best bang for your buck can be found at Super Hotel Lohas in Nara, just 11 miles away from the tea fields. For those who desire a little more activity and a night life scene, than there are a wealth of five star hotels in both Kyoto and Osaka, such as the Hotel Kanra in Kyoto and the Hotel Hankyu in Osaka. The Obubu tour lasts only four hours, so it makes for the perfect day trip for those that need to get out of the hustle and bustle of the Japanese urban jungles. Tours max out at six people, so every trip will be a quiet, intimate experience, allowing for some real connections to be made with the serenity and peace of the Japanese countryside. Tours are only offered on Tuesdays and Thursdays but they will be held either rain or shine. A trip to the Obubu Tea Farms is not only a chance to learn about one of the most important pieces of Japan’s cultural heritage, but it is a fascinating opportunity to dig under the surface about one of the most consumed products on the planet. We think it would make for both a stimulating and rejuvenating adventure.